How did Curry come about? 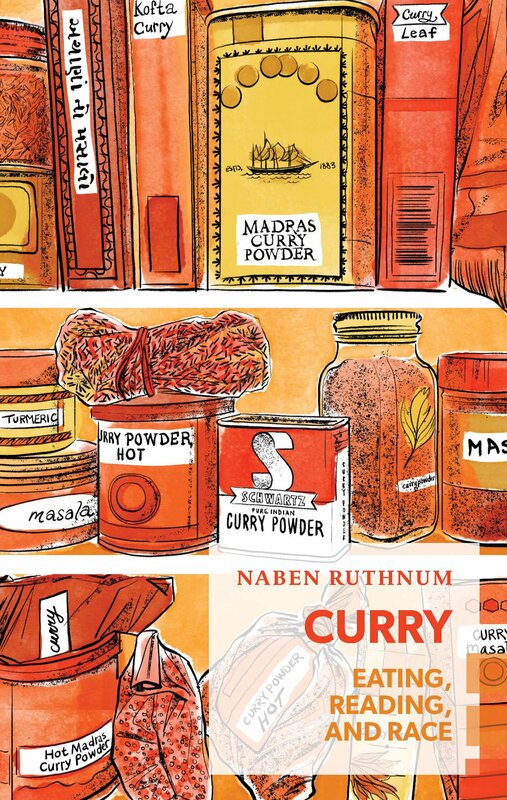 AB: Curry not only examines the genre of diasporic writing and all its permutations but is itself a mixture of genres–food writing, cultural criticism, literary analysis. I’m wondering if and how your experiences as an academic writer and crime fiction writer informed this book’s multi-modal approach? 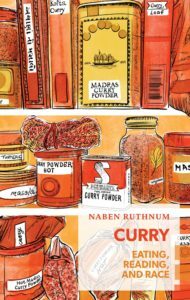 NR: As an academic writer I was always a steady 6 out of 10, but I did glean some research and argument skills that I could put to use in Curry, certainly—and yes, the range of subject matter that I look at in the book, from recipes to early 2000s stoner comedy movies, lent itself to that blended approach. I was really going for a conversational tone, something that would allow me to manage the sort of argumentative style I was going for: one based in questioning and self-interrogation, not a polemic. AB: What’s your definition of the currybook genre and what about it has frustrated you as a reader and writer? As a reader, particularly when I was unfairly judging these books by the way they were marketed and the audience I felt annoyed to be considered a part of, I was annoyed that the range of brown experience in the west was being repeatedly boiled down into trope-heavy narratives to provide an easy sense of relatability to brown readers (not the worst thing in the world, of course) and a convenient sort of cultural tourism to other Western readers. And then, as a writer, I began to feel it was dreadfully true that I was expected to write in this genre if I wanted a career. AB: I really liked your emphasis on specificity as a tool for warding off the forceful pull of hackneyed narratives. And yet people do respond sincerely and strongly to well-worn, problematic narrative patterns–especially with regards to stories by and about marginalized communities. How do we train ourselves and convince our audiences to move towards particularity? NR: I don’t think it’s as important for audiences to question why they are drawn to less particularized narratives—enjoy what you want to enjoy, it’s fine. But as writers, editors, publishers—I think this is a challenge that should be addressed by self-interrogation and wide reading, and a sense that a writer with a strong “voice” is also a writer who is writing stories we haven’t read before. AB: I’m curious about the moments in your research when your frustration with the currybook genre actually morphed into pleasure. How does pleasure figure in this conversation about bequeathed tropes? Is there space to play? Are there ways that frustration and pleasure get enmeshed when working with generic expectations and limitations? 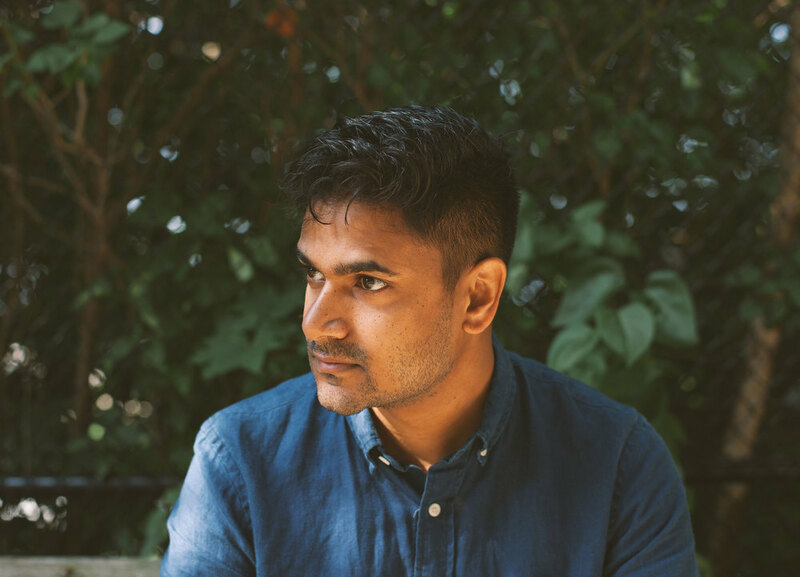 NR: The pleasure is important in that it both showed me that I’d been, unsurprisingly, wrong to dismiss books that reflected some or many of the currybook tropes as being bad pieces of literature, and it also gave me insight into how I could enjoy writing a book in this world if I were a slightly different type of writer. I think it also showed me exactly how books like the ones I discuss in Curry can be read for readers looking for a sense of recognition, of being represented in the experiences of a published writer—I’m deeply sympathetic to this drive, even if I do interrogate the notion of a homogenous, shared brown identity in the West, and whether such a shared identity is desirable. I’ve encountered that meshing of frustration and pleasure as a reader and writer of genre fiction, particularly in the crime and horror fields: you do want to be frustrated by the ways in which the story deviates from expectation, and that is part of the pleasure of reading an original work in a trope-heavy genre. AB: How has your relationship with diasporic writing changed over the years? NR: I’d shorten that timeframe to months, and say that many of my foolish prejudices, founded as they were in my fears of what was expected of me as a writer, evaporated in my research for this book. There are certainly plenty of awful books that adhere to the currybook code–but also many sincere and worthwhile works of high and popular literature that brush against the tropes–many of which are, of course, founded in truth. I’m still a reader who isn’t necessarily drawn to books written by people who look like me or may have similar family backgrounds. AB: In a workshop I took with the poet Cathy Park Hong, she asked us about the distinction between writing to people and writing for or on behalf of people as a useful way of thinking through these issues of representation. How does this distinction resonate with you and your writing? NR: Very much! I’m a strong advocate of selfish writing, which I think can do as much or more for perceptions of categories of people as deliberately political, “on behalf of” writing can. AB: I could hear your sardonic voice while reading Curry. I think this tone is integral to your claims–there’s a sincerity embedded in your sarcasm. How does humour allow you to get at these critical knots? NR: Humour is a way of getting at the truth, not avoiding it. I think a lot of unfunny people think that a joke is a dodge or a cute ornamentation of a difficult subject, but used well, it can be an abrupt and effective way of bringing seemingly disparate points together, or deflating sacred notions that need to be interrogated and re-interrogated. AB: What kinds of conversations are you craving that this book will spur? NR: Uncomfortable ones in publishing! And, crucially, I’m hoping that definitions of what constitutes “diverse writing” are pressured a little more by this book. Naben Ruthnum won the Journey Prize for his short fiction, has been a National Post books columnist, and has written books and cultural criticism for the Globe and Mail, Hazlitt, and the Walrus. His crime fiction has appeared in Ellery Queen’s Mystery Magazine and Joyland, and his pseudonym Nathan Ripley’s first novel will appear in 2018. Ruthnum lives in Toronto. Adèle Barclay’s poems have appeared in The Fiddlehead, PRISM international, Matrix, The Pinch and others. Her debut poetry collection, If I Were in a Cage I’d Reach Out for You, published by Nightwood Editions in 2016, was the winner of the 2017 Dorothy Livesay Poetry Prize and was also shortlisted for the 2015 Robert Kroetsch Award for Innovative Poetry. She received the Walrus Poetry Prize Reader’s Choice Award in 2016, and was the winner of the 2016 LitPop Award for Poetry. 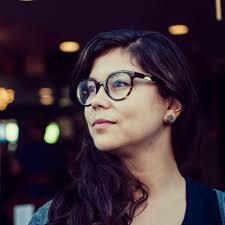 She is the Interviews Editor at The Rusty Toque.